No. 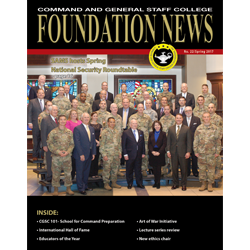 22/Spring 2017 (May) | Command and General Staff College Foundation, Inc.
Congratulations to the 2017 CGSC classes of SAMS and CGSOC. We wish them well as they head out into the heart of our Army to provide the leadership and skills they have honed here in the halls of Fort Leavenworth. 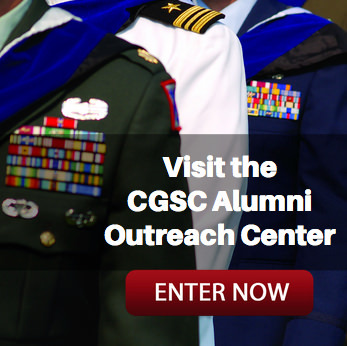 – In this issue we continue our “CGSC 101” series that highlights the College’s teaching departments and schools with a feature on the School for Command Preparation (SCP). We are also featuring the latest NSRT program hosted by SAMS, the newest inductees to the International Hall of Fame, a summary of the 2017 ethics symposium, as well as a story about the second exhibit of “The Art of War”…and more. As usual, we want to remind you that we publish a “digital version” of the magazine on our website. When you view this version online, all the links you see in the print edition will be active. 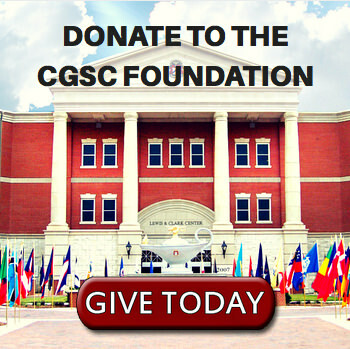 We hope you enjoy this 22nd edition of the Foundation News.